How can I do a fade-to-black in MMD? Can I do a fade to black without using a video editing program? Can I do a fade to white in MikuMikuDance? Easily fade to black or fade to white! The Blackout effect by Soboro 「そぼろ」 is easy to use and it gives you the ability to fade-in and fade-out from within MMD! 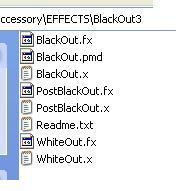 Download the effect Blackout3 from the OneDrive effects page. Unzip/extract the folder. It’s all in English so any extractor is OK. Inside the folder are a handful of files… and you can see there is a .pmd controller model and the three .x effect files. To automatically get the proper draw-order for this effect, load your accessories before you load the effect… then load the .x effect… now load the PMD controller model before you load your other models; the controller should be your first model. Don’t be too concerned about this… you can always fiddle with the model draw order and Accessory Edit to make the effect work as you wish. When you first load the .x effect, the screen goes black. You have to load that .pmd controller and slide the one facial slider to adjust that black. The controller works like any other model… register your setting for smooth transitions as you fade-to or fade-from-black. Whiteout is also available… and you can load it along with the blackout as long as you check or uncheck the Display box to turn them on and off. Blackout allows you to fade-to-black and make a scene/stage/model change… and then fade back into your animation… all without using a video editor. Not much more to say… except I also see a PostBlackout.x effect and I do not know what that’s about. I tried it out… and all I get is solid black… unwavering black. When YOU figure it out, let me know and I will update this post! Is there a way to use the blackout effect on models instead of the whole screen? Or to make certain models and accessories unaffected by the blackout? I’m trying to make a model fade-to-black and unfortunately the Silhouette2 effect doesn’t allow me to do this. Hi Gracie. IMO, the easiest way to do that is by editing a model and creating a material morph for it. 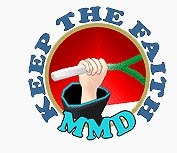 See https://learnmmd.com/add-facial-options-using-PMDE/Manipulate_Sliders_Page2.html .